In this issue, Josiane et al. reported use of fractional CO 2 laser on facial skin after previous volume injections. This commentary aims at emphasising on the depth of filler placement relative to dermal thickness and depth of ablative plus coagulative column of fractional CO 2 laser and variability in this penetration depth with various makes of CO 2 lasers. Understanding of laser tissue interaction of CO 2 laser revolves around the concept of ablation or vaporisation, where the target reaches more than 100°C, and coagulation or thermal damage, where the tissue heats up for less than 100°C. As per Goldman,  one of the pioneers of ultrapulse wave technology, for a water-containing complex tissue model like skin, the critical fluence of vaporisation (ablation) is 5 J/cm 2 delivered as a single shot in less than 100 μsec. Low-power machines achieve this by delivering a train of pulses of lower fluences. 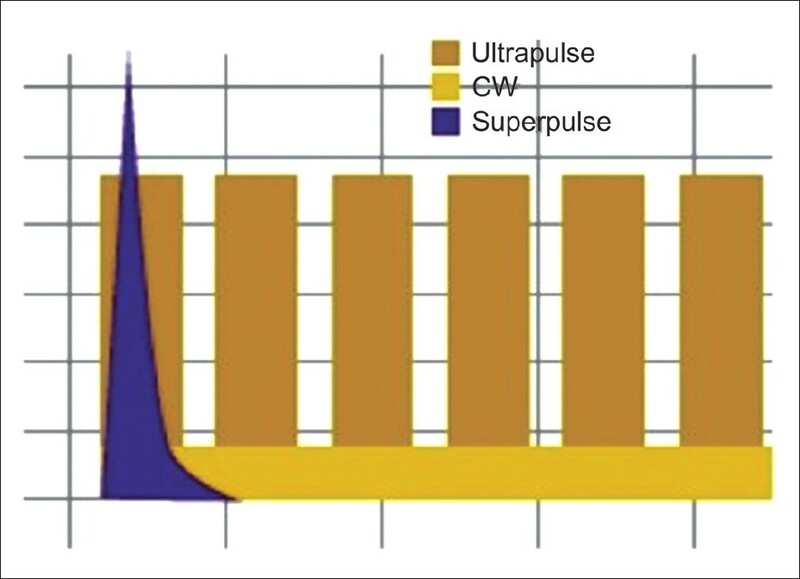 These pulse profiles are popularly known as chopped CW, Superpulse and Ultrapulse [Figure 1]. Ratio of ablation to coagulation and that of width to depth of ablative column are the crucial factors in laser tissue interaction of these lasers, apart from fluence. While considering a previously filler injected patient, for fractional CO 2 laser, two research queries arise: Whether the fractional CO 2 laser ablation (and/or coagulation) column reaches the depth at which the fillers are placed (2 mm and below), and if it reaches, whether it has any biological effect on stability of the fillers. We will first address the first query whether CO 2 laser can really reaches the depth of filler placement. Active FX (Ultrapulse, Lumenis, Santa Clara, CA, USA) used in the said study at 125 mJ fluence achieves a depth of 112 μ (0.11 mm) of ablation and around 100-200 μ of coagulation (total 300 μ), while Deep FX at 15 mJ fluence achieves 450 μ (0.45 mm) depth of ablation and around 300-800 μ more coagulation below the base (total 1 mm). These are the data on Lumenis white paper. These depths are well within the upper dermis and not enough to make significant alteration in fillers usually placed in deep dermis and below. But is it true in all situations? It is true only with the parameters under study here. But in practice, more aggressive parameters are commonly used. Active FX at 200 mJ reaches 0.24 mm, while Deep FX at 35-40 mJ fluence that is commonly used for deep scars reaches up to 1.2 mm. The company has come up with a new module called SCAAR FX (Synergistic Coagulation and Ablation for Rejuvenation) that starts with 60 mJ fluence and a penetration of 1.8 mm. Its maximum penetration claimed is 3-4 mm and is used for hypertrophic scars . Using SCAAR FX off-label for acne scars is a common practice. To these depths of ablation of 1-3 mm, add a variable zone of coagulation or thermal damage and a still wider zone of inflammation. The sum of ablation, coagulation and inflammation will be the effective impact zone of fractional CO 2 laser. Unfortunately, width of the coagulation zone around the ablative column is either not well studied or differs with the make of the machine. Hence, a word of caution before we jump to the conclusion that fractional CO 2 lasers are safe to use after fillers, as CO 2 fractional ablative depth could be anything from 0.1 to 3 mm. The second query, i.e., whether fractional CO 2 laser alters the properties of previously placed filler, will again have two variables: Direct damage with ablation reaching tissue temperature >100°C, and extended damage with coagulation and inflammation. Direct ablation will depend upon the depth of penetration, as discussed above. Coagulation component (and subsequent level of inflammation) depends upon the peak power of machine, pulse profile and distance between two fractional ablative columns (density). As a rule of thumb, higher fluence should always go with lower density, so that heat is not built up in the tissue. To summarise, more coagulation is more inflammation. Whether this inflammation translates into alteration of quality of placed filler is another research question that underlines the need of future larger studies. The third point of caution is that these proportions of ablation to coagulation and width to depth change considerably with pulse profile (CW, Superpulse and Ultrapulse) and peak power of machine. Unfortunately, parameters discussed in the article on Ultrapulse Deep FX and Active FX may not be translated in the same face value with other machines. The present study underlines the safety of using fractional CO 2 laser in ultrapulse mode with moderate parameters in previously injected patients, while one has to be again careful while using more aggressive parameters. Lastly, we would like to remind the tetrad of safe use of CO 2 laser-pulse profile ultrapulse (Superpulse and above), high-power device, low density, and moderate fluence to keep the ablation depth to around 1-1.5 mm. 1. Josiane H, Ismaël M, Roy M, Grace O, Farid S. Efficacy and safety of 10,600-nm carbon dioxide fractional laser on facial skin with previous volume injections. J Cutan Aesthet Surg 2013;6:30-2. 2. Arlette JP, Trotter MJ. Anatomic location of hyaluronic acid filler material injected into nasolabial fold: A histologic study. Dermatol Surg 2008;34:S56-63. 3. Goldman MP. Cutaneous and cosmetic laser surgery. 1 st ed. Philadelphia, PA: Mosby Elsevier; 2006. p. 158-76. 4. Alster T, Jean Curruther, Matteo Clementoni, Mitchel Goldman, EV Ross, Elizabeth Tanzi, et al. Lumenis ultrapulse: Physician recommended parameters, Lumenis product guide. Santa Clara CA USA; 2012. 5. Kono T, Chan HH, Groff WF, Manstein D, Sakurai H, Takeuchi M, et al. Prospective direct comparison study of fractional resurfacing using different fluences and densities for skin rejuvenation in Asians. Lasers Surg Med 2007;39:311-4.